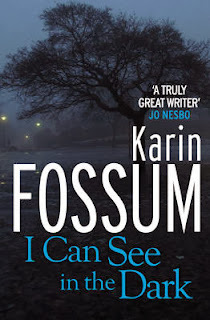 I CAN SEE IN THE DARK doesn't feature Karin Fossum's series detective Inspector Sejer but rather is a short book about a dysfunctional character called Riktor. Riktor, lives on his own, has no friends or family and works in a care home for the elderly where he does nasty things to the residents – pinches them, flushes their medication away and so on. He often sits in a nearby park where he gets acquainted with a down and out alcoholic Arnfinn. Arnfinn begins to come round to Riktor's for a drink until something awful happens. But then Riktor is arrested for the murder of a resident of the care home, however he isn't guilty of that crime. Will he get convicted, should he be convicted or does he deserve a second chance? I CAN SEE IN THE DARK falls in the psychological crime genre rather than a whodunnit or police procedural though there is a very determined Inspector who knows Riktor's done something bad. It's an interesting story, musing on justice and the law and even makes the reader, ironically, root for Riktor to escape being wrongly convicted. This is not one of my favourite Fossums but a different reader may get more out of it than I did. If you like her later Sejer books then you will probably enjoy this one. Read another review of I CAN SEE IN THE DARK. Thanks for the fine review, Karen. I do like Fossum's work, and I'll probably read this; it sounds interesting. Still, I have to admit I prefer the Sejer series.